James Fry is a Graduate of the Master of Arts degree program in Christian Psychology and Counseling from Ashland Theological Seminary in Ashland, Ohio, in conjunction with Emerge Counseling Center in Akron, Ohio. 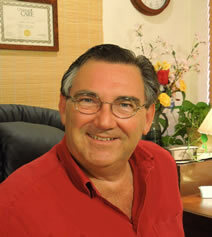 He has over 30 years of experience in Christian ministry, counseling and therapy. He has been a full-time psychotherapist counseling individuals, marriages, families, children and adolescents in Ohio and Florida since 1983. He has also served as an inpatient therapist at Riverside Behavioral Center in Punta Gorda, Florida, and as a therapist and supervisor of therapists at Peace River Outward Bound, where he worked with adolescent males referred by the courts. Conditions Jim treats include: Depression, Divorce, Grief and Loss, Anxiety, Parenting of Children and Adolescents, Thought Disorders, Marital Issues, Communication and Conflict Resolution, Emotional Healing for Abuse, Adjustment Disorders, Relationship Problems, and Recovery from Co-Dependency.